We provide a fast and efficient Courier Delivery and Delivery and Installation service for your furniture or equipment orders. 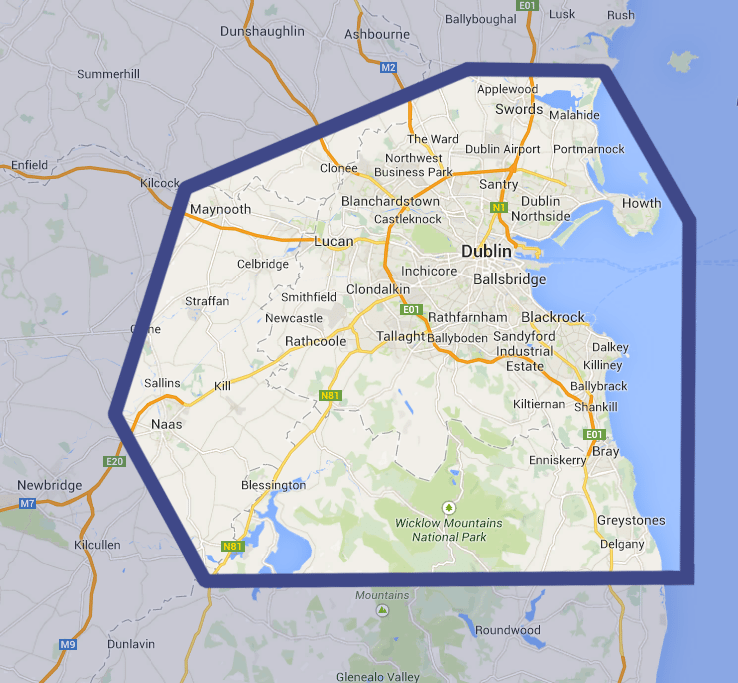 We deliver to the whole of Ireland, including Dublin and the city’s surrounding area. Wherever possible, we offer a next-day delivery service. We deliver furniture and equipment to addresses throughout Ireland. We use a reliable third party courier service and charge a flat rate of €11.99 ex.VAT for the first product, and €4.99 ex.VAT for each additional product. When availing of this service, there are some of our products that will require assembly. This service is not available for used or several items we stock. We deliver and install furniture and equipment throughout Ireland. For addresses in Dublin and the surrounding area, a flat rate of €40 ex.VAT is charged for online web orders regardless of the size of the order (refer to the map below to check eligibility). For the delivery and installation of furniture and equipment to the rest of Ireland, simply click here for a free quote. It is the buyer’s responsibility to check the dimensions of an item in our product listing and ensure it will fit in the intended space. If you are unsure, you are welcome to contact our sales team for advice. We will assign all rights passed on by any of our suppliers to the buyer, as far as it is able to do so. We will have the option of repairing or replacing any parts which are agreed to be defective, as long as they have been returned within a minimum period of one year from the date of delivery, at the buyer’s expense. Products which have been subjected to misuse, alteration, modification, overuse, defective maintenance or wear and tear are excluded from this guarantee. Invoiced prices will be those currently charged by the seller, when the order is despatched. We strive to ensure that all prices displayed on the website are correct. However, in the event that a pricing error is made and an order is placed, the buyer will be told and given the option of either cancelling the order or continuing with the order at the corrected price. Prices are all subject to VAT. The seller is not liable for any consequential loss or damage costs, except in respect to death or personal injury caused as a direct result of the seller’s negligence.